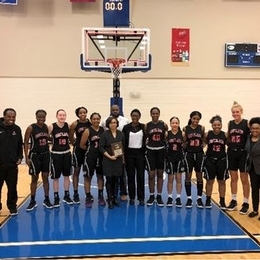 The Sinclair Women’s Basketball (27-4) finished the 2017-18 campaign one game away from advancing to the NJCAA Division II Sweet 16. In a season full of excitement, the Pride recorded some very impressive records and milestones. Nationally ranked the last seven weeks of the regular season, Sinclair wrapped up the journey in the Top 10 with a #9 final ranking. The win in the final regular season game at Lakeland clinched a share of the OCCAC regular season conference title and the first banner since 2008. The group of four sophomores (Nia Martin, Laquelle Jacobs, Aaryn Evans & Madison Connally-Banks) finished their careers as the winningest class in Sinclair history with a record of 50-12. The 132 point performance at Lorain County set a single game scoring record and coupled with scoring over 100 points nine times during a season also set a new Sinclair record. Other new team single season records also included; 15 home wins, 13 OCCAC wins, 7 home OCCAC wins, 6 road OCCAC wins, 8 non-conference home wins, 1,482 total rebounds for a season, 590 offensive rebounds for a season, 416 steals for a season and 86.13 points per game. Entering post-season play, Sinclair was the #2 seed in the District Tournament played at Ohio Christian University in Circleville, OH. They would find a Finals match up against the other OCCAC Co-Champs Owens CC. Both teams split the regular season winning at home. The Championship game would showcase two NJCAA Top 10 teams battling for a right to advance to the Sweet 16. Owens ranked 5th and Sinclair ranked 9th nationally did not disappoint as Owens held on down the stretch with a 73-64 victory. In only her third full year as Head Coach, Victoria Jones has put Sinclair Women’s Basketball back on the map. The former NCAA Division I Assistant, earned her first OCCAC Women’s Basketball Coach of the Year Award on the heels of a powerful 27-4 final record and a school record 70.8% (68-28) career winning percentage. Leading the way on the court was the OCCAC Player of the Year, Amanda Schroeder (6-00/FR – Carroll H.S.). In 31 games, she set a school record for total points scored in a single season (807) and points per game average (26.03). Schroeder finished the season with an 89.1% free throw percentage for a single season Sinclair record to go along with scoring 30 points or more 10 times, which is both a single season and career school record. Her dominating play earned her OCCAC Freshman of the Year, NJCAA District I Player of the Year and NJCAA Region XII 1st Team and OCCAC Player of the Week honors 5 different weeks. One of the main members of the record setting sophomore class, Aaryn Evans (6-00/SO – Thurgood Marshall H.S.) was named to the OCCAC 2nd Team. She is the only player in Sinclair history to pull in over 340 rebounds in each of her two seasons (378 & 344). Aaryn is also the only player in school history with over 700 rebounds, 100 steals and 60 block shots for a career. It was also not surprising that Evans was named OCCAC Defensive Player of the Year behind a school record 428 career defensive rebounds, she joined teammate Schroeder on the NJCAA District I 1st Team. Madison Connally-Banks (6-01/SO – Kettering Fairmont H.S.) finished off a productive career being named OCCAC Honorable Mention. Both Madison and Evans are the first set of teammates to have over 100 offensive rebounds in each season of their two seasons. Freshman Point Guard, Kierre James (5-02/FR – Lima Sr. H.S.) also earned OCCAC Honorable Mention honors. James started 26 games averaging 10.3 points per game and pacing the Pride with a team high 4.6 assist per game.